1). 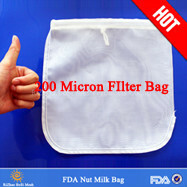 material of reusable nylon filter bag: nylon micron monofilament filter mesh. 2). 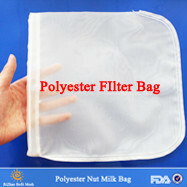 shape of resusable nylon filter bag: square or round bottom, usually round bottom is more popular. 3). your own label can be added. 4). usually use the poly bag for packing. 5). usually 1 carton can pack 150 bags. 4. 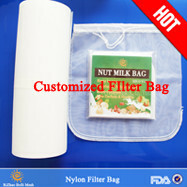 Multi-purpose, making nut milk, juice, coffee, red wine, cheese, etc. 6. 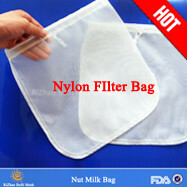 FDA certificate is avaliable, safety material. cheesecloth & outlases cheese cloth. 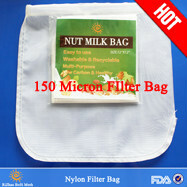 Sturdy draw string of filter bags- great for soaking and great for hanging. 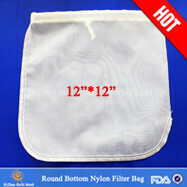 Rounded corners of filer bags- Great for a down right flow of liquids into containers while straining without spilling. the liquid to fall into a bowl. Squeezing the bag. 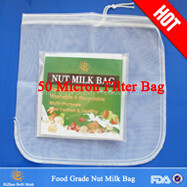 Empty nut, veggie or fruit pulp into another bag or container and wash the bag completely under running warm water. 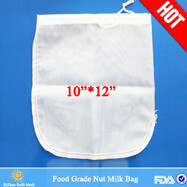 fold the bag twice, then put into plastic bag, inserted with label, put in carton or as customer's requests. 1.small quantity, shipped by courier. 2.large quantity, shiped by air or by sea.